We know relatively little about the language of the Beothuk because they avoided contact with English settlers and fishermen and thereby greatly reduced opportunities for communication. An exception was the case of a person, who, in the early 1600s, had lived with the Beothuk for five years and was said to speak their language very well. Unfortunately, nothing further is known about this person and he seems not to have passed on what he had learned. Once captives were brought back to English communities, from the mid-1700s onwards, the English would have been able to become familiar with the Beothuk language but few people made use of this chance. For example, a Beothuk woman, who was captured by William Cull in 1803 remained in his household for close to a year; yet, Cull never recorded what she might have taught him and his family. Fortunately, other men were more provident and obtained lists of Beothuk words from the captives Oubee, Demasduit and Shanawdithit. The child Oubee was seized from her family's camp near Charles Brook in the summer of 1791. She was taken into the home of Thomas Stone of Trinity. Two years later, the Stone family moved to England where Oubee died. While she was still residing in Trinity, Capt. G.C. Pulling came to see her. Pulling was preparing a report on Beothuk-English relations and hoped that he would be sent to the Beothuk on a peace mission. Being anxious to be able to communicate with them he asked Oubee for the Beothuk equivalent of 111 English words. This list was later filed with the papers of the Earl of Liverpool and has since been published in a research series of The Rooms Provincial Museum Division in St. John's, NL. Pulling's Word List: "The Following Words of Their Language Are All I Can Yet Procure"
The first entry reads: "Ou=bee...the name of y/e Indian girl who lived w/th Mr. Stone." Courtesy of the British Library (MSS ADD 38352 f.48), London, England. Demasduit (or Mary March), the informant of the second wordlist, was captured in March 1819 at Red Indian Lake. When her husband, chief Nonosabasut, came to her rescue the settlers killed him; their baby died shortly afterwards. Demasduit was placed under the care of the Rev. John Leigh in Twillingate and was said to have learned English remarkably quickly. Once she could express herself reasonably well Rev. Leigh compiled a list of about 180 Beothuk words. A year later, when Capt. Hercules Robinson of HMS Favorite visited Rev. Leigh, he copied the wordlist and later published it. Part of Rev. Leigh's original list is preserved in the The Rooms Provincial Archives Division, in St. John's, NL, but the pages with English words starting with the letters C, D, H, M, N, and W are missing. However, these words can be found in Hercules Robinson's copy. Note the entry: "Indian (red) Beathook." Courtesy of The Rooms Provincial Archives Division (MG 257), St. John's, NL. The third wordlist comes from Shanawdithit, who was the last known member of her tribe. Sick and starving, she and her mother and sister surrendered to furriers in 1823. Two of the women soon died; Shanawdithit survived and was taken into the household of John Peyton, Jr., on Exploits Island. About five years later she was transferred to St John's, to the home of W. E. Cormack, founder of the Boeothick Institution. Cormack questioned Shanawdithit at length about the history and culture of her people and elicited from her many Beothuk words and phrases. This wordlist came into the hands of the British linguist, Robert G. Latham, who published it in 1850. Cormack's manuscript list has been lost, but Latham had made copies which are now available for research. Memorial University's linguist, John Hewson, has integrated the three vocabularies into one master wordlist of 325 glosses plus twenty-one numerals and the names of months. Note the last entry: "Red Indian Behathook." Demasduit's and Shanawdithit's wordlists include the terms "Beathook" and "Behathook" respectively, meaning "Red Indian." This is the name the Beothuk used for themselves. Cormack wrote that "Boeothuck is the pronunciation of the word in question - or Boethuck, or Boethick, the emphasis being on the diphthong oe and almost dropping the o." Today, the word is usually spelled Beothuk. The term most likely expresses a plural, k being the animate plural ending in Algonkian languages. Among English speakers it also denotes singular and plural. 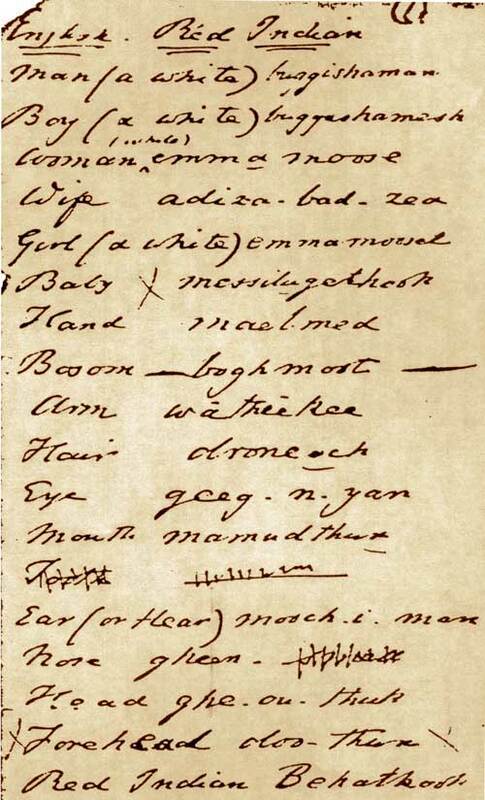 The publication of several versions of Beothuk wordlists, in the late 1800s, evoked a lively debate of whether Beothuk is a language of its own, without affinities, or whether it is part of the Algonkian family of languages. Latham believed that Beothuk was an Algonkian language, however obscurely related, and his view has persisted into this century. Ives Goddard, specialist in Algonkian languages at the Smithsonian Institution, is skeptical and believes that if Beothuk is related to Algonkian it can only be on a very deep time level, that is, it would have split off from the (hypothetical) Proto-Algonkian parent language at least two-and-a-half to three thousand years ago. John Hewson, who has demonstrated some grammatical and structural resemblances between Beothuk and Proto-Algonkian words agrees that Beothuk is markedly divergent in its vocabulary. He nevertheless maintains that it is related to the Algonkian family of languages, though the exact nature of this relationship cannot be established at this time. It is presumed that all Algonkian languages are derived from a single precursor, the (hypothetical) Proto-Algonkian that would have been spoken about three thousand years ago in the area between Georgian Bay and Lake Ontario. As this group expanded, it is thought to have broken up into ten or so distinct Algonkian speech communities. These were the forerunners of three Plains and six Central Algonkian languages, among the latter are Cree and Montagnais (Innu), and three Eastern Algonkian languages, which include Mi'kmaq. While Beothuk is considered to be part of the greater Algonkian language family, the linguistic evidence is not sufficient to decide whether it belongs to the Central or Eastern Algonquian type. However, recent archaeological findings in Labrador point to a precontact Beothuk affiliation with Central Algonkians rather than with an eastern group. It is therefore assumed that the Beothuk language has greater affinity to Innu rather than Mi'kmaq. ©1999, Ingeborg Marshall on behalf of the Beothuk Institute.